Near the end of the M62 is this new development, with a range of separate facilities rather than a single amenity building. First two hours free for all vehicles. After which HGVs must pay £13.75 per 24 hour period. Prices are paid for within the Spar shop. Glews used to be the name of a vehicle workshop located on the old A614, before it was diverted to meet the new M62. 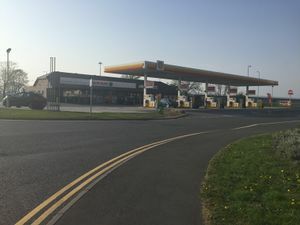 Being close to the M62, the land was seen as ripe for development, and soon attracted a car showroom, a motel/restaurant, petrol station and a McDonald's, with room for further expansion. In 2017 the workshop was turned into a large HGV parking area and filling station, a new roundabout was built to accommodate the traffic, and new 'services' signs were placed at the entrance. The service area is not signposted from the M62, but it calls itself Glews services and relies on it being visible and easily accessed.